Yesterday I sold the AUDNZD and I added to my position after it rallied to 1.0840. I will short it again at 1.1000. 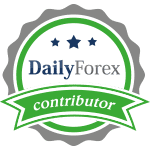 Today I am taking a short position in the EURNZD as I think forex traders are best advised to lock in some of the profits after a rally which spanned roughly 1,500 pips. Volatility could be at elevated levels as upward momentum is strong, but the recent failure to breakout above its resistance level has started to shift momentum and a breakdown below it should set this currency pair on course for a bigger reversal.